Through Your Hands… in stores now! 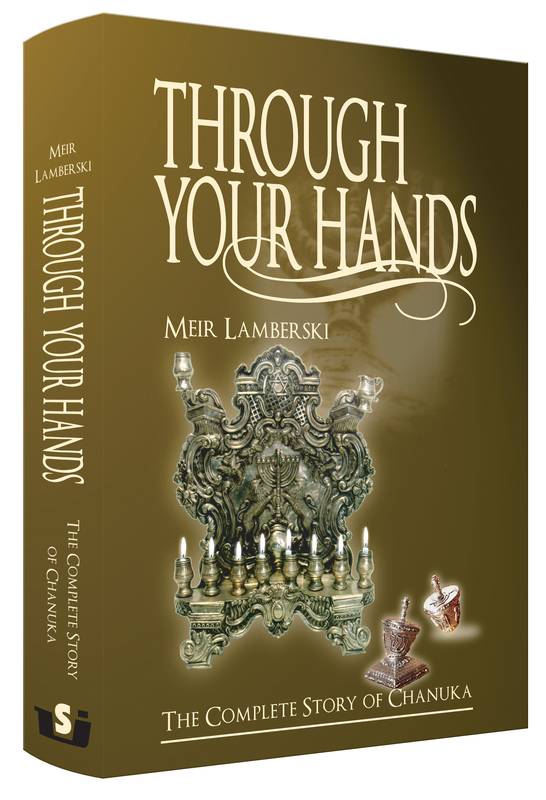 Rabbi Meir Lamberski has made a career of synthesizing epic events in history into easy to follow, chronologically written stories. His series of seforim in Hebrew, on Chanukah, Purim, the Churban, and Matan Torah are immensely popular. The stories of the Churban and Purim, On Your Walls O Jerusalem, and Al Hanissim, respectively, have been adapted into English. In time for Chanukah comes the newest adaptation into English, Through Your Hands – The Complete Story of Chanukah. The book can be purchased in better Judaica stores everywhere, or online. The absolute wickedness and cruelty knew no bounds, and Philipus didn’t give himself a moment’s rest from trying to harm those who were loyal to the Torah in Yerushalayim. One example is the story of Elazar the kohein. Elazar was about ninety years old. A tremendous talmid chochom of sterling character, he was one of the respected members of the community. He was a judge in the Sanhedrin and a rosh yeshiva. When I was little, aside from the fact that I had to walk two miles to school uphill both ways because only the rich people could afford horses, another depressing fact was that there was no such thing as American Jewish humor. Sure, there were some old Yiddish jokes, but only people who appreciated the “flavor” of Yiddish and also the flavor of Slivovitz thought that they were funny. Mordechai Schmutter changed all that. Beginning sporadically, he worked his way up to a weekly Hamodia Magazine column. He’s still shocked that Hamodia even has a humor column, but the tens of thousands of readers who look forward to it each week are glad that it does. His first book, Don’t Yell Challah in a Crowded Matzah Bakery was a gamble at first because it was the first of its kind, and the gamble paid off as it became a best seller. Meanwhile, his column, which began with such everyday topics as cooking, marriage, and writing humor columns, has expanded into areas such as GPS, Kosherfest, and the Syms Bash. 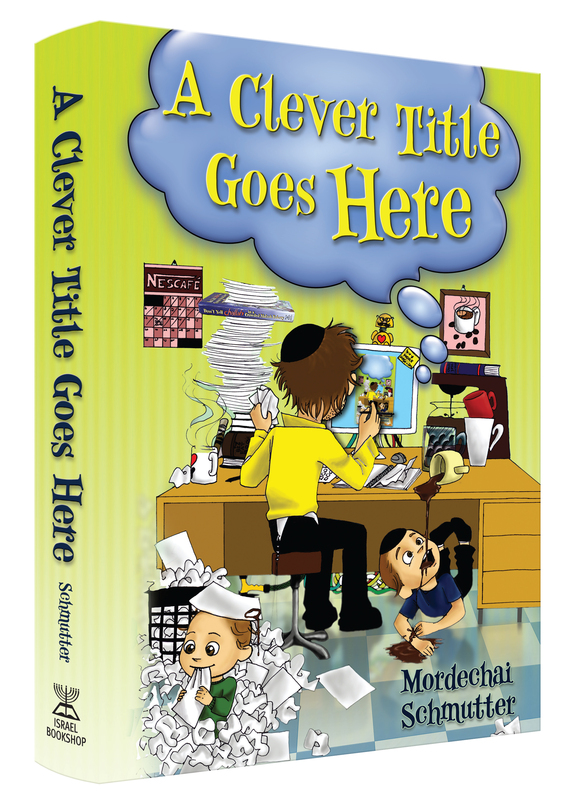 Now, Mordechai is publishing his second book, A Clever Title Goes Here. Aside from the clever title, it also has many of his funniest articles in it, one of which you can read here! Oy, Gevalt! I Almost Forgot! Some people are naturally good at buying gifts. Everyone knows some hyper-organized individual – the type of person who finishes cleaning for Pesach the day after the previous Pesach, and who shows up at parties for people she doesn’t even know with neatly wrapped presents that come from the heart, such as sweaters that she knitted herself in front of the fire on a couch that is covered in plastic. Should Jewish Books Require a “Hechsher” Stamp of Approval Attesting to the “Kashrus” of their Contents or Not? Brief explanation: Sometimes Jewish books contain material that some readers may find offensive, improper, or non-age-appropriate. There are those who contend that there should be an advisory board reviewing books before publication and deciding whether or not to grant their seal of approval on them. That way, as readers, we could be sure that any book we pick up will meet our standards perfectly. On the other hand, others may argue that as mature and thinking individuals, we should be choosing the literature we want for ourselves and for our children to read; it should not be left up to others to decide for us. Fear not, dear reader…this is not another new magazine. This is something different. As readers, we all know the cozy feeling of sitting down, or curling up, with a brand new book in our hands…..We finger the new pages, fresh from the printer…some of us go so far as to smell the paper (don’t deny it, now :-))…. We know you love books. This magazine, published seasonally, will focus on new book releases and other book-industry related articles. We hope you will enjoy getting the “scoop” on new books, even before they hit the shelves…. There’s another thing: Our goal is to always be on “The Next Page” of Jewish publishing…. To this end, we reach out to you, our industry experts, for your opinions. Please turn to the back page of this publication for an opportunity to make your voice heard, and become a part of the process. As an added bonus, you can win $100.00 and other prizes, just for the fun of it! See ‘ya on the next page! In the fifty plus years since Israel Book Shop was founded, the world of Jewish literature has evolved from a few siddurim and Chumashim for a fledgling community, to an array of books in all genres for all ages; books which appeal to a flourishing Torah world. It is characteristic of any established society to express its unique experience through literature. Israel Book Shop Publications is the vanguard of literature in the Orthodox Jewish community. Israel Book Shop Publications publishes and distributes novels, books on self-help, humor, contemporary halacha, and hashkafah, as well as classic reference books on the Torah. Our books address the Orthodox Jewish community of the 21st century. Moving forward, we will continue to bring the best contemporary literature to the Orthodox Jewish community. This blog will be, im yirtzeh Hashem, a place for Israel Book Shop to communicate with our customers, listen to feedback from our readers; and a center for Israel Book Shop Publications offers and contests. Start by answering our first call for feedback. Vote in the “hechsher poll” conveniently located to the right of your screen, then leave an explanation of your comment or opinion in the comments section of the post above. By leaving your comment, you are automatically entered in our drawing. Happy voting (and commenting)!